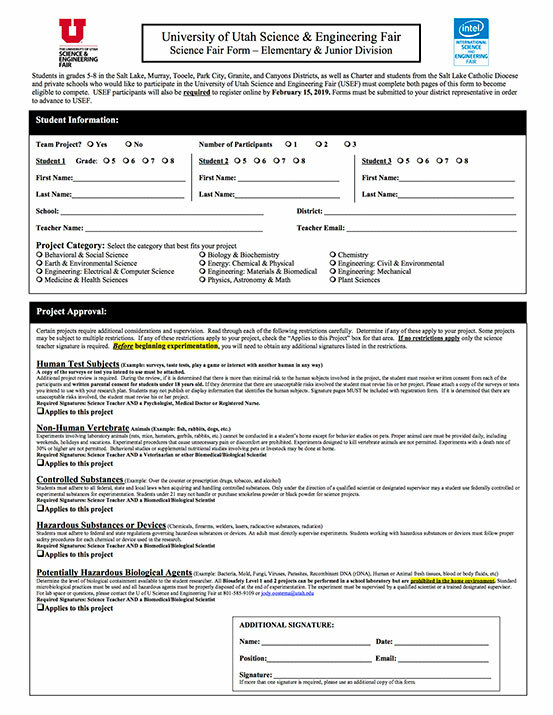 ALL 9th through 12th grade students need to fill out and submit ISEF forms in order to advance to USEF. If you have science fair students in grades 9-12 who are planning on participating in USEF, you should direct them here and have them create an account so they can get this process underway. Once they are logged into this area, they'll answer a few questions about their project to determine which ISEF forms are required. From there, they can download blank forms, fill them out and then upload them for approval. Here is the first of a new series of videos we're making to share tips and tricks on how to have a successful science fair. First video: Don't Freak Out. This week we explore how to get kids excited about the science fair and how to guide their brainstorming efforts towards an appropriate and interesting idea. Here are a few other resources that will make your science fair life a little easier. NCES.ed.gov: A great site that shows kids how to do statistics, math and graph their data. "Science is a way of knowing, a process for gaining knowledge and understanding of the natural world. The Science Core Curriculum places emphasis on understanding and using skills. Students should be active learners. It is not enough for students to read about science; they must do science. They should observe, inquire, question, formulate and test hypotheses, analyze data, report, and evaluate findings. The students, as scientists, should have hands-on, active experiences throughout the instruction of the science curriculum." Tips and a worksheet for selecting an interesting science fair project. Writing a great project abstract is one of the most important things about your project—here's a quick guide on getting it right. A few tips about your display board. A list of common projects to (please) avoid. Be unique! A scoring sheet for projects. A blank scoring spreadsheet for use in school & district fairs. Specific information on how to judge CS projects. An overview of Demonstrations vs. Experiments, The Scientific Method, Engineering Design Process and Grading & Judging. Slides from the Statistics for Science Fair, Some Basics presentation. A good overview of statistics use in science. A helpful document for teachers to help their students create the best project they can. What judges will look for when deciding if a project is ISEF-worthy.